Home > Educational Comments > What Links Arithmetic to Mathematics? Are you ready to cross the bridge from Arithmetic to Algebra? Pre-Algebra is the single most important pre-requisite for success in higher math courses (Algebra 1 & 2, Geometry, Trigonometry, Pre­Calculus, and Calculus). The distance covered on the math course continuum is dependent upon the student's preparation for their first theoretical math class, first year Algebra. 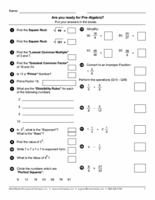 Success in Algebra 1 is dependent upon the preparation received in Pre-Algebra. The stronger the foundation in Pre-Algebra and Algebra, the farther the student will be able to advance in math courses. "The more you know, the farther you go..."
Basic Algebra concepts will be learned through introductory explanations and examples followed by practice problems with on-demand solutions. Quizzes for each learning section and cumulative test upon completion of all the learning sections. Scores are recorded on the included database. MathMedia Algebra Basics is a high quality Pre-Algebra software program that continues to stand the test of time in our product line.